"I want to promise you, this will be a government of action, not of words." "Charming" isn't a word often used to describe genocidal dictators, but for a brief period, the adjective fit Idi Amin. With a jovial manner and endearing eccentricities, the Ugandan general beguiled Western diplomats and journalists, as well as the citizens of his small African nation, after he seized control in 1971. But as the saying goes, absolute power corrupts absolutely, and soon the isolated Amin lost touch with reality. His paranoia and xenophobia increased, and he sought to protect his stature and quell dissidence by eliminating any threats�both real and imagined. A reign of terror ensued, and by the time he was deposed in 1979, Amin reportedly killed as many as 300,000 of his own people. Nice guy. Amin's story may not be pleasant, but it's morbidly fascinating, and director Kevin Macdonald deftly juxtaposes the regime's absurdity and horror in his compelling film treatment, The Last King of Scotland. With an astute eye (and fine script by Jeremy Brock), Macdonald paints a disturbing yet surprisingly human portrait of the tyrant�a combination that makes Amin all the more terrifying. We may never understand his motives or accept his cruelty, but watching him bewitch the public, manipulate advisors, and evolve into a raving maniac who embraces barbarism to maintain a warped sense of order is often mesmerizing�and that's largely due to Forest Whitaker's penetrating, Oscar-winning interpretation. On its surface, The Last King of Scotland seems like a straight biography of Amin, but it's really the fictional story of Nicholas Garrigan (the equally excellent James McAvoy), a young Scottish doctor who comes to Uganda to escape the stifling constraints and asphyxiating boredom of life in the British hinterlands. Like many Westerners, he's instantly seduced by Africa's exotic scenery, wildlife, and people, and a sense of altruism overwhelms him. He hopes to "make a difference" by catering to the underprivileged at a country mission, but a chance meeting with Amin changes everything, and once Garrigan gets a whiff of the power, influence, wealth, and status members of the general's cadre enjoy, his motives quickly turn self-serving. For his part, Amin has always admired the strength and will of the Scottish people�often expressing it by wearing the kilt and enlisting a Ugandan bagpipe brigade to perform at state functions�so it's no surprise Garrigan's heritage attracts him. He takes the doctor under his wing, and soon beseeches him to become his personal physician. Flattered by the attention and tempted by the trappings, Garrigan accepts, not only selling his soul to the devil, but also, ridiculously, becoming his closest advisor. An idyllic honeymoon follows, but after he witnesses Amin's brutality, and is ordered to rubber-stamp his "policies," Garrigan opens his eyes, and at last begins to comprehend who Amin really is and the horrific principles for which he stands. He also discovers it's much easier to enter Amin's inner circle than leave it. Macdonald wisely tells The Last King of Scotland from Garrigan's perspective, which strikingly parallels the slow awakening of many Western nations to Amin's atrocities. Like Guy Hamilton, the green reporter Mel Gibson played in The Year of Living Dangerously, Garrigan begins his odyssey as a glib, cocky bloke who boldly believes he can navigate a primitive third-world society and assimilate into a political system he knows nothing about. Yet unlike Hamilton, Garrigan isn't particularly likeable, and abuses his position of power with the same recklessness as Amin. It's a tough role, but McAvoy handles it with aplomb, never compromising Garrigan's conceit to gain sympathy. Whitaker, however, took home Oscar gold, and earns every ounce of it. With a performance of blistering intensity, he captures Amin's essence�the grand showboating, blustery bravado, and crippling paranoia. Though it would be easy to overplay the part and turn Amin into a cartoon caricature, Whitaker smartly pulls back, using his hulking frame and piercing gaze to emphasize Amin's intimidating presence and subtly transmit his deteriorating mental state. At one moment, he's playing the accordion and telling jokes, while the next he's hurling invectives and ordering executions. Such drastic mood swings are often difficult to believably enact, but Whitaker so immerses himself in Amin's twisted psyche, he seems utterly natural...and profoundly scary. The movie, too, naturally evolves from a light-hearted look at a bizarre ruler to a taut, grisly thriller. Many scenes are not for the faint of heart, but are necessary to show what can happen when society allows a madman to run amok. Fittingly, Macdonald uses his strong background in documentary filmmaking to lend The Last King of Scotland a more realistic edge than other tales inspired by historical events. Idi Amin may be gone, but this unsettling film makes sure his heinous deeds�and those of other notorious dictators around the world�will not be forgotten. Image Transfer Review: The advance screener disc sent by Fox manages to pass muster, but can't match the level of clarity and depth most recent films enjoy when transferred to DVD. Well-saturated colors help spotlight Africa's lush beauty and devastating poverty, while crisp close-ups heighten the intensity of the actors' performances. Fleshtones�ranging from pasty white to deepest black�look natural and often striking when they share the same shot, but contrast and shadow detail could be punched up a notch or two. For the most part, the picture sports a smooth texture, but a few rough patches exhibit such heavy grain they resemble raw documentary footage shot on 16mm. Hopefully, such sequences will be corrected before the final disc hits the street. Audio Transfer Review: The 5.1 mix remains surprisingly dynamic throughout the feature, with the surrounds kicking in often to add essential atmosphere to exterior scenes. The buzz of insects and dull hum of crowd noise waft across the rear speakers and draw us deeper into the story, while sporadic gunfire, explosions, and the rumble of jet engines keep all the channels active. As a result, dialogue occasionally sounds a bit muffled, and the difficult-to-decipher Scottish and Ugandan accents don't make it any clearer, but that's the only drawback to this superior track. Extras Review: A fine assortment of supplements enhances the disc, beginning with a workmanlike audio commentary by director Kevin Macdonald. The grandson of acclaimed British filmmaker Emeric Pressburger, Macdonald spends a good deal of time discussing the location shooting in Uganda, the use of local extras, and how the government supported and embraced the film. He sprinkles in several anecdotes about Amin (noting that many still regard him as a counter-culture hero), and outlines Whitaker's intense preparation for the role. He also classifies the film as "a love story between two men," and likens Dr. Garrigan to a battered housewife who can't escape a destructive relationship. At times, Macdonald's dry delivery becomes tiresome, but the track offers plenty of worthwhile information and perspective. A 12-minute compilation of deleted/extended/alternate scenes (with optional commentary by Macdonald) follows, and includes an abandoned prologue depicting a young Amin impressing British soldiers in the boxing ring. 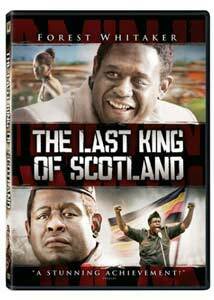 From its title, one might think Capturing Idi Amin to be a documentary analyzing the ruler's rise and fall, but it's really an in-depth look at the making of The Last King of Scotland and how it interprets history. The 29-minute film opens with several archival clips of the actual Amin interspersed with contemporary reflections on his character and deeds from those who knew him and lived under his regime. Journalists, doctors, government officials, and average Ugandan residents share their views and experiences, and provide a chilling portrait of an unstable man. The documentary also examines how the film's story (which novelist Giles Foden classifies as "eighty percent fiction, but mostly fact") meshes with the real-life events it depicts, and what liberties the filmmakers took for dramatic effect. Although a straight biographical profile of Amin would have further enhanced the disc, this finely produced piece is an acceptable substitute, shedding additional light on this fascinating yet fearsome figure, and inspiring us to learn more. Forest Whitaker: "Idi Amin" gives the actor a chance to relay his own impressions of the ruthless dictator, his relationship with Garrigan, and attitude toward playing such a reprehensible character. McAvoy also weighs in about Garrigan's motivations and Whitaker's "terrifying" performance during the slick six-minute featurette. More substantive, Fox Movie Channel Presents: Casting Session�The Last King of Scotland chronicles how both Macdonald and Whitaker became involved with the project, and examines how Whitaker shed his gentle giant image to slip into Amin's notorious skin. Whitaker terms Amin "the most complicated character I've ever played in my career," and recalls how he met with the despot's relatives and studied Swahili to ready himself for shooting during this interesting eight-minute featurette. The Last King of Scotland is a dark tale that keenly examines one of the world's deadliest dictators in a fictional context that's both enlightening and frightening. Forest Whitaker embodies Idi Amin, but his Oscar-winning portrayal is only one of several excellent elements that distinguish this compelling, thought-provoking film. Highly recommended.